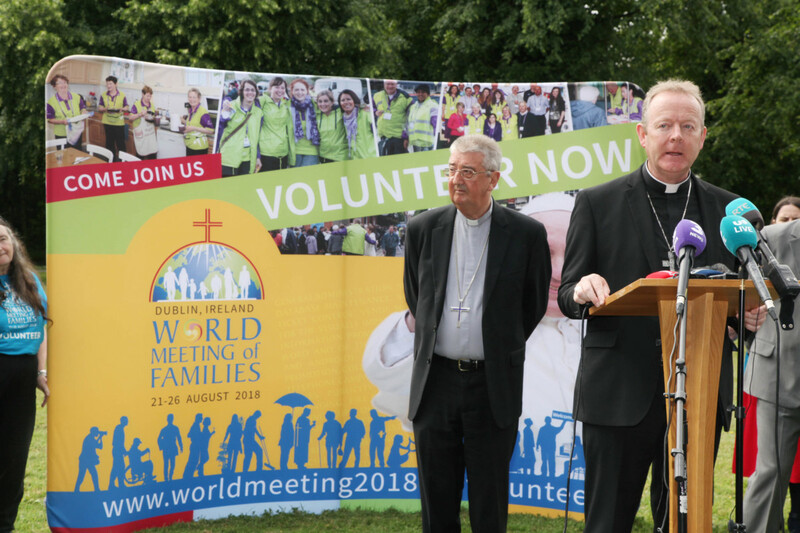 Archbishops Eamon Martin of Armagh and Diarmuid Martin of Dublin today welcomed details of Pope Francis’ itinerary for his visit to Ireland for the ninth World Meeting of Families which takes place in Dublin from 21–26 August. The Holy Father’s itinerary, published this morning by the Holy See Press Office, includes a visit to the National Marian Shrine at Knock, and a private visit to the Day Centre for Homeless Families of the Capuchin Fathers as well as attending the events of WMOF. This morning’s press conference also saw the publication of the full programme of the Pastoral Congress for WMOF in the RDS in Dublin. Speaking at the launch of the programme this morning at Saint Patrick’s College, Maynooth, Archbishop Diarmuid Martin, President and host of WMOF2018, said, ‘My hope is that now the World Meeting of Families – the pastoral preparation, the Pastoral Congress in the RDS and the visit of Pope Francis – will open out for families renewed inspiration, hope and healing. He continued, ‘Pope Francis is above all a free man. He shows us we can live in a world where faith seems marginal and yet manage to touch hearts and challenge them to reflect on and discern those fundamental values vital for society. What he does is to find ways in which he can win hearts for what the teaching of Jesus involves, not through imposing and judging, but through winning and attracting. Archbishop Martin concluded, ‘Family is about love, no matter how imperfect and failing: it is about a love that enriches lives. I am thinking about the love of spouses, the love of parents for children, the goodness with which families enrich communities. We have great families who would never think of themselves as great: they simply do their best. Where would any of us be without the love and generosity we received from our parents? ‘I wish to sincerely thank all those in the Church in Ireland and the public authorities all of whom, in their own areas of competence, have made an enormous contribution to ensure that as many people who wish to can take part in the events. Welcoming the announcement that Pope Francis will visit the Shrine of Our Lady of Knock, Archbishop Michael Neary said, ‘One of the most beautiful sights at Knock is to see families, sometimes the three generations praying and enjoying the peace and tranquility of the Shrine. The Apparition at Knock was family apparition incorporating Our Lady, Saint Joseph, Jesus as the Lamb of God, and John as representing the extended family. He added, ‘Knock was considered to be a most suitable venue for the official launch, on 21 August 2017, of the unveiling of the World Meeting of Families icon, and the one-year countdown to the beginning of the World Meeting in Dublin in August 2018. Amoris Laetitia will be the guiding theme of the three-day Pastoral Congress in the RDS, which will see workshops on the topics of: The future of marriage preparation in parishes; the challenges of handing on faith in the home today; and, looking at the key challenges facing families today. The Congress will be lay led and couple led, with lay couples forming the largest group of the 200 announced speakers. Close to 30,000 people have already registered to take part in the Congress with almost 6,000 of those aged 18 or under. 11,000 of those registered are international, representing 103 countries. The full itinerary for Pope Francis’ visit, as well as more details on the WMOF Pastoral Congress, can be found on www.worldmeeting2018.ie.